Greek director (DOGTOOTH and THE LOBSTER) Yourgos Lanthimos’s latest feature is a supernatural psychological thriller that is the most difficult to watch despite its bouts of black humour. The film follows Dr. Steven Murphy (Farrell), a cardiac surgeon who is first seen at a diner meeting with a 16-year-old named Martin (Barry Keoghan). The doctor buys the boy an expensive watch as a present. The relationship between the two is revealed as the film goes on. Steven introduces Martin to his wife (Nicole Kidman) and two children. Martin, determined to ingratiate himself into this unfamiliar new family, becomes something like an adopted son. Strange things begin to happen with the children developing paralysis right out of the blue. Secrets start coming out of the closet. Director Lanthimos unveils bits at a time, thus keeping the audience in anticipation. It is safe to say that the film gets more and more serious and ends up becoming quite a disturbing watch. Lanthimos does not skimp on the violence and language. The film has a lot of anger and the anger is slowly but surely unleashed by every one in the party concerned. 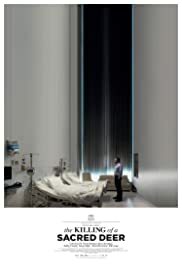 THE KILLING OF A SACRED DEER is a well executed psychological and emotional horror film but not for everyone!